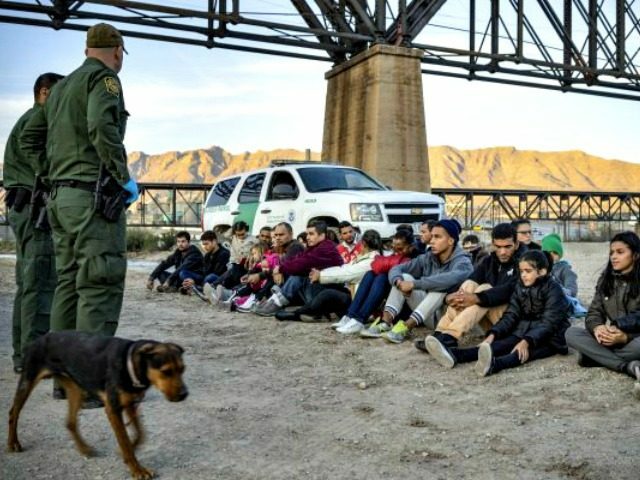 National Border Patrol Council President Brandon Judd says the Department of Homeland Security (DHS) is considering a plan to allow U.S. Border Patrol agents to administer "credible fear" interviews to border crossers that would "exponentially" drive down soaring illegal immigration levels. During an exclusive interview with SiriusXM Patriot's Breitbart News Tonight, Judd said illegal immigration at the U.S.-Mexico border could be quickly cut and the policy of Catch and Release could be ended if DHS authorized Border Patrol agents to conduct immediate interviews with illegal border crossers claiming asylum. "The statute only says that it has to be an immigration officer that does the credible fear interviews. So you can train Border Patrol agents to give credible fear interviews on the spot. If an individual fails a credible fear interview, that individual becomes subject to deportation immediately. That person does have appeals rights but that appeal has to be heard within ten days. Instead of taking two to five years to deport somebody, we could deport somebody within ten days if the credible fear interview is done on the spot." The proposal, detailed by Judd in a Washington Times op-ed, has been under consideration by DHS Secretary Kirstjen Nielsen but has yet to be implemented. The plan was "actually proposed" by White House senior adviser Stephen Miller, Judd said. "If the "credible fear" process begins upon arrest by Border Patrol agents, instead of at a later interview before an asylum officer, the process will be much more efficient. If an asylum-trained senior patrol agent determines that the alien has not established a credible fear, an order of expedited removal can be issued, and the illegal border-crosser can be removed immediately. The illegal border-crosser does have appeal rights, but by regulation an immigration judge must hear the case within 10 days of the person asking for reconsideration. Again, because this is not a criminal proceeding, the burden of proof remains on the illegal border-crosser, not the U.S. government. If no credible fear is established, the process would take no more than 10 days instead of the 2 to 5 years it now takes to deport an illegal border-crosser who claims asylum. This simple adjustment would end catch-and-release." Judd said the implementation of the plan would cut illegal immigration down to the historically low levels that the U.S. saw when President Trump was sworn into office. "Let's go back to April 2017. We dropped to 45-year lows of illegal immigration and we dropped to those lows on the promise that if you cross the border illegally, you would then be subject to deportation proceedings," Judd said. "Because we didn't follow through with that promise, now that number has grown astronomical to a point where its simply totally out of control," Judd continued. "Now let's go back and let's say 'Okay, we failed to do what we needed to do in April 2017, we're now going to do it' and once we start following through with that promise to actually hold people pending their deportation proceedings, illegal immigration will drop exponentially ... that's exactly what will happen if this plan is implemented." Breitbart News analysis has revealed that at current projections of illegal immigration at the U.S.-Mexico border, Catch and Release levels, and visa overstays, the nation is set to admit and resettle about one million to 1.5 million border crossers and illegal aliens this year. Due to the Trump administration's expansion of the Catch and Release program, DHS is on track to release roughly 434,000 border crossers and illegal aliens into the country by the end of the year. This projection is based on current estimates that more than 36,000 border crossers and illegal aliens have been released from DHS custody every month since the beginning of the year.